At Williams of Petersfield, we love walking around the local area and taking in the fantastic buildings and views on offer. However, if you walk the streets every day or you are more than familiar with what Petersfield has to offer, you sometimes need to view the local area with a new purpose. We think going on an Easter Hunt will help your kids love their surroundings while giving you the chance to see your local area with fresh eyes. Hopefully, you recognise our Williams shield logo but if you don’t, take a long and hard look at it. Remembering our logo will give your kids the chance to grab an Easter egg. We have painted some rocks and stones with the Williams of Petersfield logo, and we are going to hide them around the town. If you want clues as to where the rocks and boulders are hidden, our Facebook page has everything you could want or need to gain an advantage over other people. By engaging with our Facebook site, by liking, subscribing and following, you will receive exclusive access to the tips and hints that we’ll post about the location of our painted stones and rocks. Parents and older siblings are allowed to assist with the hunting process, but make sure it is your child that claims their prize. Also, some of the stones will be quite large and may be heavy, so it is vital that you look and lift carefully. 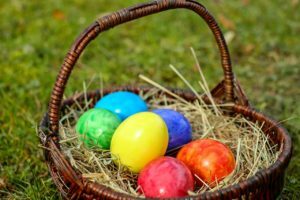 We hope you have fun with the Easter hunt, but we don’t want anyone getting injured so search carefully and if you do find a stone, lift it carefully or get help from others if you need it. At Williams of Petersfield, we are committed to serving the local community, and we want to spread joy in the local area. If you and your kids are looking for a fun activity or a task that will brighten up an everyday walk, be on the lookout for rocks and stones painted with our logo. Also, if you want exclusive hints as to where we have hidden the rocks, remember to check out our Facebook page.